To get your team passing better, this quick, crisp soccer team diamond combo is a great passing drill and will have your players building a foundation of the basic runs that should be made to cover all of the park. - This soccer team passing drill is set up with just 4 cones in a diamond. Have B+D at an angle 7-10 yards from A, and cone C roughly 15-20 yards in line with A. - All balls begin with A. - A passes to B, B passes to A, A passes to C, C passes to D, D leads a pass between A+B for D to run onto and finish at the end of the line at A. - Players must "check away" prior to showing for a pass. This means they should create space and drag a defender away from that space by jogging 3-5 yards away from the ball, prior to a quick sprint back towards calling for the pass. - All players should be on their toes all of the time, no standing still. - Passes should be 1 touch, made firmly and accurately. - Players should call for every pass. 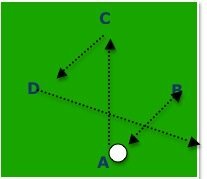 - Switch directions so first pass begins A to D.- Add a passive defender in each of B, C, and D who only provide pressure, not trying to win a ball. - Lead into the shooting drill called Combo To Goal. - 5-7 minutes for this soccer diamond combo drill.